People say that the definition of insanity is when you do something over and over again and expect a different result. By this logic, I must be insane, because I keep watching the Forensic Heroes installments even when previous ones have blatantly suggested I should do otherwise. Obviously TVB didn’t read my review of Forensic Heroes 2 because if they did, they would know that “NOT MATCH” is incorrect grammar. I told you, TVB, it’s either “NO MATCH” or “NOT MATCHING.” No one listens to me. Anyway, that was enough to kill any credibility for this series, even with their individual tablets for each cop and gigantic table-sized touch screens in the lab (aren’t we in a recession?). I laughed during all the meetings with those gadgets because while they were there to demonstrate that the forensic team and the cops know what they’re doing, anyone with a brain who has watched the Forensic Heroes series knows not to take them seriously. Subtlety is a rare thing these days, so the audience should be able to appreciate the acting from both Wayne Lai, who can do no wrong, and Maggie Cheung, who makes a comeback to TVB in this drama. While this is not Wayne’s best performance, it is refreshing to watch him in a beta academic role and also as a father, both of which we do not see often. Maggie Cheung convinces in her role, although her chemistry with Wayne leaves something to be desired. Nancy Wu continues to improve, and her performance as the ambitious, arrogant Eva is very good. Watching Eva’s relationship with her husband wasn’t nearly as uncomfortable as I thought it would be. I thought of it as creepy as first, especially when it was revealed that she was a “fan” of his when he gave a presentation as a guest speaker at her university. A very “Tom Cruise / Katie Holmes” relationship that was a bit disturbing, especially since Wayne and Nancy don’t have great chemistry. The little girl who played their daughter is excellent and reminds me of Jo Jung-eun (who played young Jang-geum in Korea’s Jewel in the Palace). Cilla Kung was a big surprise – her performance here as the abused “Sky Eye Girl” was quite good. I suppose everyone should be allowed a horrible performance or two (in Cilla’s case, it was her turn as Ron’s lover in The Four). Ron Ng is Ron Ng in here, meaning a mediocre performance and he looks distracted and weary half the time (I’m sure Viann Zhang was a factor in that). In fact, if I were Viann Zhang I’d be pissed too because he and Kate have good chemistry and look like a couple in here. Kate’s interpretation of her character, for her part, is misguided. Gone are her usual spunky, I-can-throw-a-punch tomboy portrayals. Instead, she strikes me as girly and even a bit naïve, which is all wrong for the role and doesn’t help the fact that visually she really does not convince as a Senior Inspector. But even she and Ron can’t beat Wu Fung in the bad acting department, who takes the cake for worst performance. I’m on the fence about Ruco Chan in here. I watched him in The Other Truth, a series that I couldn’t finish and mainly because while he can act, I don’t think he has the leading man charisma. Here he plays a supporting character and I wasn’t bored to tears. The main issue I have with him other than the lack of charisma is his look is very arrogant, and when he smiles, he looks pretentious and patronizing. Not his fault, some people just have that issue but I find him hard to like because of that. I kept thinking his character was a villain while watching Forensic Heroes 3 every time he smiled because it was such a patronizing smile. Nil chemistry with Maggie here. Who else was in this? Oh yeah, Edwin Siu and Aimee Chan. Neither of them were memorable and both struck me as idiots. Every time I watched their bickering, I would ask, “How did you get this job?” and Angel used to work for CSI? Sorry, I had to cancel what I had planned for the following week after that episode because I was still laughing my a- – off. I also have a strong suspicion that if Aimee hadn’t gotten together with Moses, TVB would have pushed Edwin and Aimee as a cash cow couple because they had numerous scenes in here (that alternate between predictable, uninteresting and unfunny) and also an anti-climax ending. The much talked-about bra scene was also unnecessary and overhyped. The one good thing about their pairing is that Edwin really seems to like Aimee, and I believe the rumours that he actually fought with Moses for Aimee’s hand (so to speak), and well, lost spectacularly. The case cameos? The best was the trio of actors who played Ron Ng’s family members (Lui San, Florence Kwok, and that actor who played the villain in A Kindred Spirit). I don’t know why TVB does not use Florence Kwok more. She is amazing. The worst cameo? Stephen Huynh, hands down. The cases themselves in this series? Meh. The only one I remember was one of the first where there was a shooting at a wedding or something. Everything else was forgettable. Even Wayne Lai can’t save this one. Save your time. Maggie’s comeback to TVB was actually Beauty Knows No Pain, which aired in 2010. It’s pretty good. Forensic Heroes I was probably the only decent one. FH2 was boring (thanks to KC and Charmaine and their boring romantic side plot turned main plot), and this one was just plain forgettable. I already forgot some of the stuff they did in here already, and it’s only been about five months. From what i read, Maggie’s comeback to TVB was My better half(老公萬歲), which she paired up with michael miu. You’re right. I completely forgot about that one as I didn’t watch it. 1- the tablets and gadgets overdid. 2- Initial thought of the marriage between Wayne and Nancy was weird (maybe b/c of the age gap) but Nancy’s performance was convincing. 3- Cilla was quite good since I thought her performance in “Yes Sir, Sorry Sir” was quite annoying. 4- Sometimes I even forgot that Ron was one of the leading actors. He fades into the background. 5- I totally agreed that I keep expecting Ruco to be a villain (I guess he has many villain roles when he returned to TVB). 6- Maggie’s character wasn’t anything memorable, it looks boring too BUT her performance as a pathologist was the most convincing/ believable (in my opinion beating Wayne’s Pro Sir). 7)the overdid and overuse of SUNGLASSES!! I bet they are the most fashionable officers in Asia region lol. 8) you forgot abotu kate’s dolly hairstyle, as a superindent, she still have time to fix her hair and wear high heels to work everyday..she looks more like a lengmo than a high ranking officer. I wanted to mention about Kate too but I’m afraid the list seemed long. Since you mentioned it, the funniest scenes were Kate and her team did the catwalk. She walked so seductively like she was modeling for lingerie. so what all this about kate herself saying that she’s a tomboy and she tries to look seductive all the time. these professional roles are just not suitable for her. My memory of Kate in this is her dancing with Ron. And them making gooey faces at a restaurant. Waste of ‘leads’ position seriously. No chance of a breakthrough performance. Maggie was the “saving” factor in this series. And, maybe Nancy. Wayne’s performance wasn’t bad, but he paled in comparison to Bobby. Ron’s role was actually better than the usual hot-headed cop. Ok, now Kate. She was horrible! She needs to stop posing and start acting again. What part of her made her look like a senior inspector? The hair? Excessive lipgloss? Boots? OMFG agreed! Kate dont even try to look like a cop! Horrible take from an actress to a character! Why is she still.one of the top 5 fa dan? Must be all thesucking up and handbags to 620! Oh, forgot Aimee and her English lines. Jeez! It’s fine incorporating English terms, but it got annoying when Aimee started saying a bunch of them. Was it an excuse for her accent? Her accent is her natural accent. Frankly I can’t differentiate between Canadian and American accent. You seriously expect Hong Kongers to know the difference between Canadian and American accents? Even Canadians and American themselves sometimes can’t distinguish between the two unless you listen very carefully. I was fine with the random English because she was suppose to be an ABC after all (and ABCs do randomly speak in English), but it’s just the way how it was executed that made her lines awkward. Edwin’s whole “You are Chinese! Yellow skin! Black hair!” was really annoying though. Man. I was seriously WTH at her being part of CSI… Seriously. HOW DOES THAT EVEN MAKE SENSE LOL. I think it’s not hard to tell texans and canadians apart? IKR. What kind of female cop wears boots almost everyday??? I also think her hair was a major factor. Female cops in almost every other drama either ties their hair into a ponytail or keep it short. Kate’s hair was long and curly, and it was kept like that in every scene. I’ve never seen female cop of those high ranking ones wear tight fitting that shows off their S shape, curly dolly hair which needs constant maintenance and high boots that hardly can run? And what is with their overuse sunglasses? why everytime they go out for duty have to wear them?? to show off how cool they are?? lol..
Cinched-waist blazers, high heeled boots, sunnies, lip gloss, pinned up fringe and curly long hair. Senior inspector. They don’t even belong in the same sentence, my gosh. I watched this series because of Maggie,but i think nancy’s performance is quite good to, one thing that bother me is Maggie and Kate’s “good friend relationship”. They don’t have that chemistry. Kate seems to ruined everything, her expressions in every scene looks the same to me. The only good performance I saw in this was Nancy. Have to say she improved a lot! Maggie has that issue with most of her female co-stars, actually… I can’t remember the last time I found her friendship with a female onscreen convincing. This series was such a disappointment. It DID NOT have the Forensic Heroes feel at all! It shouldn’t even be called “Forensic Heroes” 3 in the first place. FH without Bobby/Yoyo is nothing. Wayne and Maggie did not help at all. I also feel like TVB has been giving Ron poor roles ever since the E.U. He doesn’t even seem to have much screen time anymore. In this, and also in YSSS. Ron is somewhat demoted. He hasn’t been leading a series in a while. And, his roles are quite bland lately. He needs a breakthrough to get recognized again. But even when Ron leads e.g A Chip off the Old Block all people talked about was Mandy Wong and Sunny Chan. It was like who is Ron??? I feel as though his acting skills are lacking? He has a very monotone voice and wooden expressions. I think he suits more ancient dramas than modern series. Ron still has management contract until 2015 so he won’t discuss on the renewal by now? But TVB likes to discuss about contract renewals with their artists VERY early. Only a year before the end of the contract. Like that, if the contract ends in 2015, 2014 will be the discussing time. Earliest is 2013. Yeah, Ron has no good roles coming up. That series with Ruco, well, Ruco is more of the main. So…I’m assuming it might be the contract renewal. Perhaps, he wants to “dig gold” up north. Ron should start acting like Steven Ma to get funk out of TeeVeeBee soon. I would’ve liked to see Bobby/Yoyo & Wayne/Maggie together. Bobby can balance out Wayne’s seriousness and Maggie and Yoyo would probably be able to pull off the “girl friends” thing better than Kate and Maggie’s attempt LMAO. I like the actors individually, it is the concept and execution that is blood vomitting. I realise the name Mui Siu Ching is synonymous with Yu Zheng, that dreaded producer of those rubbish called Gong. It’s like already expecting this to be bad. When I watched it, it was terribly pretentious and very unreal. And to follow CSI another rubbish, with style over subtance, it is just terrible. Interestingly I am watching Edwin Siu in Strange Hero Yi Zhi Mei and he is doing pretty well in there. So in the end it is the darn script. To begin with Forensic Heroes has 2 sucky predecessors, so the fate is sealed. Mui Siu-ching is better than Yu Zheng. At least she HAD some pretty good ones (I myself really liked “Colourful Life”, the drama that inspired “Virtues of Harmony”). I can’t think of one good Yu Zheng drama that is not dreadful. Probably the only rather intelligent one was Schemes of a Beauty. I mean 10 rubbish there must be 1 gold! I just hope for the sake of my favourite new toyboy he doesn’t rubbish State of Divinity. I think The last princess were quite ok except that I don’t like Leila in this one. He’s adapting Smiling Proud Wanderer? Dear lord, stop with these remakes already! Beauty Schemes is pretty good. All the women characters are written good. Yu Zheng! Don’t ruin SOD! But inexplicably, MSC’s series such as FS3, Can’t Buy Me Love, and Beyond the Realm of Conscience all garnered high ratings among Hong Kong audiences, though for the life of me I just can’t understand why. But if that’s why HK audience like (per rating results) that’s what MSC gives. So actually, Hong Kong tvb audience is partly to be blamed for TVB inferior quality series. I could not finish CBML. Watched the first 5 episodes and gave up. If CBML was trying to be funny, it failed because I didn’t find it funny at all. Just ridiculous. The family “clapping” scenes was one of the lamest things I’ve seen on television. I don’t know how anyone can get through watching it. But I guess the one good thing I like to give credit to MSC is that she uses her budget well. 1) Groupthink mentality: You got some people praising a series like a god. If one hears those praises enough, you’re almost sucked into believing that it’s true. 2) TVB has got a pre-sold audience. People like me for example, grew up with its series, so no matter much the quality has decreased over the years, you can’t quite completely get rid of TVB from your system. I like to use the analogy of a band-aid permanently fused to my skin. 3) It’s all relative. When everything you do is crappy, and enough media hype talking about ‘big stars’ and ‘big budget’ is generated, dramas like BTROC get ratings because really, what else is there to watch if you only watch TVB? I’m with Addy though. I gave up on CBML 3 episodes in and BTROC was terrible. There must be something wrong with the Hong Kong audience, when they watch MSC series. Her series have a higher ratings. But lately, its getting crappier… Did MSC or TVB hypnotized the audience in Hong Kong or something? I agree with Andy ……. [The family “clapping” scenes was one of the lamest things I’ve seen on television. ], especially in an ancient drama series. I did not like the “wraps” either which should NOT be in an ancient drama series. I watched most of CBML, but I did not enjoy it at all. Could not understand why it got a 40+ viewership rating. It beat “No Regrets” which was a good drama series with a good storyline and good acting. I really didn’t think FH3 was THAT bad…actually, i thought it was pretty good. i really don’t know why everybody is complaining about kate’s excessive lip gloss and perfect hair…its not like CSI films cops with no make-up and ugly clothes…its just for visual effects…whats wrong with that?? i think wayne & bobby are both very good actors. why is everyone comparing them together? It would have been a better series if it wasn’t called “Forensic Heroes”. The fact that the series has this name ruins the previous two. Since they give it this name, expect the audience to compare it! It’s unavoidable. People complain b/c most ppl have standards for a drama, no matter how “entertaining” it is. Since the series is advertised as high tech and scientific, people will have expectations of accuracy and realistic storylines. If the producer had revealed this installment to be a comedy called “forensic follies”, then I’d have no problem w/ kate’s salon hair, the sunglass poses, or other inconsistencies. You are right. If the name of the drama series is called “forensic follies”, then no one would complain because it’s then a comedy, and not a factual drama series. We do have standards expected from a drama. “Entertaining” or not, it is very subjective. As for myself, I don’t think a drama is entertaining to me any more after watching those stupid scenes, outfits, high-heeled boots,and fancy hair-dos of Kate Tsui as a senior inspector. Moreover, many of the developments of the drama series were not logical. If it was entertaining, then the whole outcome of this series would change to positive response. But, it did not happen. It was garbage from episode 1 to the end. Its a crapship series, doesnt deserve any star ratings. OMG the only part where I felt the “Forensic Heroes” feeling was the clown part! And yet, they conclude it right there…what a fail. I guess it’s not make you anticipate the next series? But I bet you the case will be very disappointing if they decide to make another series. Producer Mui Siu Ching stated earlier that the FH series have come to an end. And she’s leaving TVB. Sigh, lack of of producers nowadays. I wonder why they didn’t give Florence the same role instead of the rich girl one… At least there’d be one role from the original. I guess they wanted it to be set in another time and space, although it was the same west kowloon police station. I can’t remember if DIF4 was set at the same police station. DIF4 was set in Yau Ma Tei Police Station as a lot of police series are set. The outside of that station is so iconic! change of storyline; even though this was not a sequel!!! I was so hoping, when I was watching the 1st episode that a terrorist arrives and a bomb goes off and the entire characters all perish and there ends the sorry existence of Forensic Heroes. It didn’t. So my guess is in the next instalment we will still have Wayne but since Maggie is gone, TVB has prepared a bomb for her, kill her off and enters a new leading lady. Miu Siu Ching has left TVB with her husband. There might be no more FH4. End of the FH franchise, but hopefully not the end of the forensics experts. 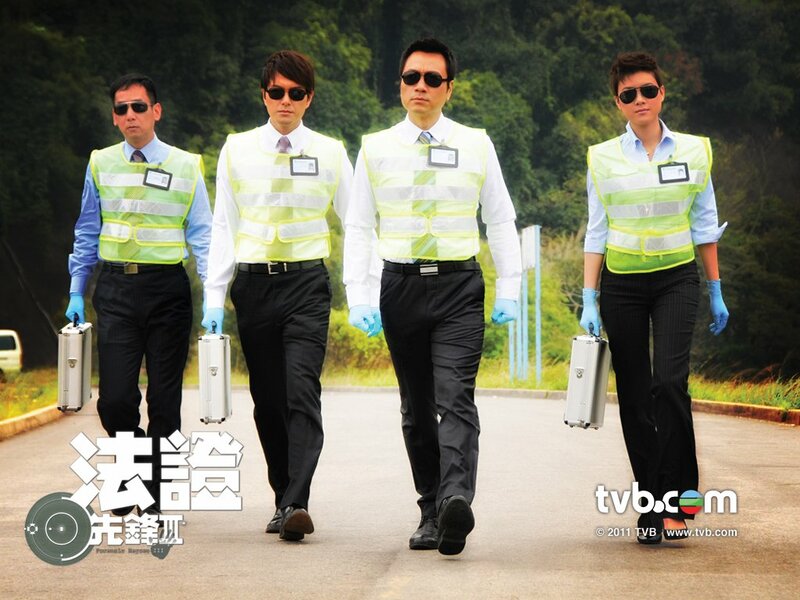 If TVB can do multiple detective/crime/cop dramas, they should consider starting another franchise on the forensics sciences! But that’s probably not going to be anytime soon. Guess what, TVB can change another producer to produce FH4, continued to milk more money. The unnessary additional cast: Moses’ girl plus a funny death – a death with zero meaning for bra girl. I think FH3 is good, and don’t really agree with your review. Your own opinion just doesn’t affect my decision at all. I guess people just have to watch it, and feel themselves and have their own opinions. anyways, it’s not really a movie that ends in 1hour30 minutes, it’s drama tv show to entertain people everyday, so I’m not sure which guideline you are using to judge this show. It’s okay. It’s funny at least, lol. The first one was a lot better though. So true, I think the baby ruined the sequel. Sonja and Roger made a really good couple in the series. Uhm think D.I.E 2 is ok but D.I.E was simply “fresher” and more creative. Bridget was writing a review on FH3, i.e. giving her opinions of the drama series. What is wrong with that? If you wish, you can write one, too, giving us your favourite things, scenes, and acting of your idols. Why write a review for a show if you watched it and, even before the first episode started, you were always assume that it was s—? Don’t get your own biases about the previous versions mixed with this one. Personally, I thought it was pretty good. Not amazing, but not worth all this biased abuse your hurl at it because of the previous two series. Why hurl abuse at Bridget for her opinion which I feel she delivered eloquently? She can compare series, after all this is supposed to be forensic heroes part 3. Same concept, same crap. And it is crap. My review will be a 3 word review. In fact that is a 3 word review from title to the end.